Do your kids refuse to drink water, even when they need it the most? These 5 tips will help you keep kids hydrated without the battle. How often do you say that to your kids each day? The Husband and I love to drink a nice bottle of cold water, and we rarely have soda or juice on hand. But even with us setting a good example, our kids fight us on getting enough water intake. Yet, in these dog days of summer, there’s no more important time for your kids to stay hydrated by drinking plenty of ice cold water. Kids who aren’t well hydrated are often more irritable and are at higher risk for disease, such as urinary tract infections. Many fruits and vegetables are very high in water content. Our favorite water-dense fruit to keep around during summer is watermelon (I even created a fun printable about it!). But there are plenty of other hydrating fruits. Strawberries, cantaloupe, pineapple, oranges, and peaches are all delicious fruits that are at least 80% water. Have you noticed that when you let your kid take control of one thing, it makes others easier? We let our kids pick out a couple small water bottles that they love, and then fill them up with water each morning after breakfast. No juice or milk allowed until the water bottle is finished. Keep the water bottles to about no more than 12 ounces in size, so it’s not too overwhelming to your kids. Otherwise, this could turn into a battle. 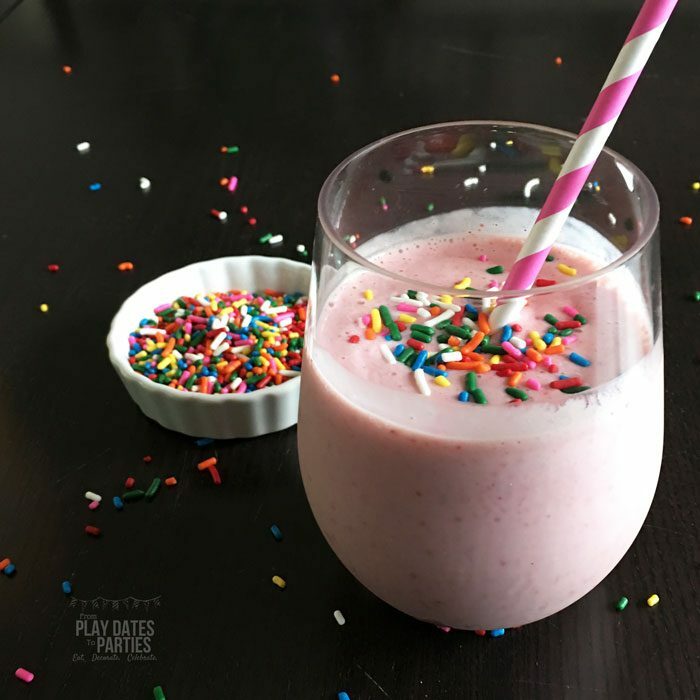 Drinking smoothies always feels like a treat (especially when you add sprinkles). But they also have many fantastic health benefits. One of the biggest health benefits is that they can keep you well hydrated. Fill your kids’ smoothies with the water-dense fruits listed above, and add a couple extra hydrating components like ice and coconut water. They will stay hydrated without even knowing it! I hate to admit it, but our kids use squeeze-in water flavoring. We had serious concerns about one of our daughter’s hydration levels, and nothing seemed to work. Finally, our pediatrician suggested mix-in flavoring as a good alternative to juice and other high-sugar beverages. Even though I expressed concern over the dyes and additives, her word were: ‘Do whatever you have to do to get her to drink more water’. That advice has made all the difference. 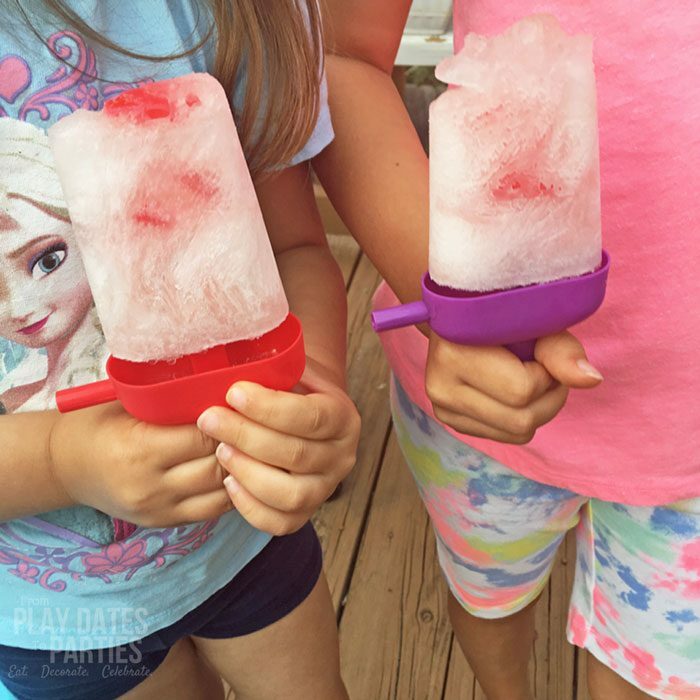 Turn your kids’ water into popsicles! 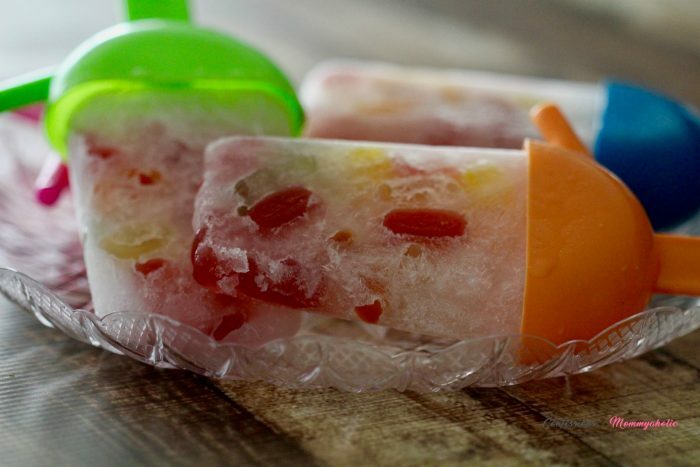 Janine Huldie of Confessions of a Mommyaholic created these adorable gummy bear filled popsicles that are a fantastic way to sneak some hydration in your kids’ diet. We have similar popsicle molds as Janine, and I found that each popsicle contains about 4 ounces of liquid before freezing. If you’re using juice for your popsicles, dilute it a little bit with some filtered water and the kids will probably never know the difference. Plus, with the special treat Janine added to her popsicles, I doubt the kids will even care! Avoid cranky, dehydrated children, and keep your kids hydrated in hot weather with these five tips. 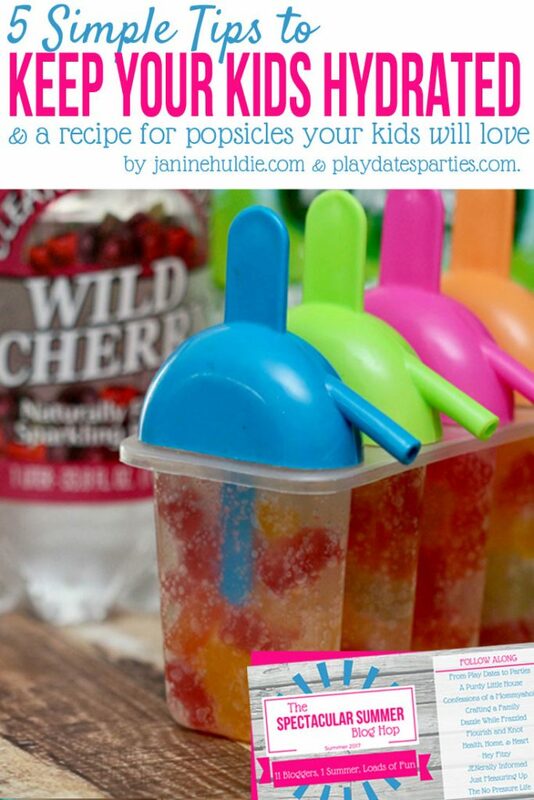 Best of all, make your own batch of Janine’s fun-filled popsicles with your kids. They won’t know they’re doing something good for their bodies, and you won’t have to nag them to ‘drink your water’ anymore. How do you keep your kids hydrated in hot weather? What would you put in your popsicles? I would love to learn how to paint or draw better. See I married an artist and I am always in awe at this skills where this is concerned and wish I could have a way to learn this skill even though I know you can’t. Each of my Spectacular Summer co-hosts is sharing a little bit more about Janine on their blogs, too. So don’t forget to hop around and see what else she has to say. Click here to find out how to make these super fun popsicles! Thanks for including my popsicle recipe here and glad you got to try them out with your girls, as well!! Janine’s recipe is pretty much the BEST! Gummy bears?! Brilliant 🙂 Hydration is so important here right now when it is 100 plus degrees. Great tips! My granddaughters almost drink water exclusively, they seem to get their water in, but boy I like those gummy bear popsicles! Thanks for sharing at Celebrate Your Story! My kids are obsessed with homemade popcicles. They make them out of any and everything. I tried making popsicles with lemonade, mixing in cherry juice in some and blueberry juice in others. They are pretty tasty! The gummy bear idea is so cute! We recently tried them with the Airhead’s Xtreme candy as a special treat. The kids loved them, but I’ll admit I cringed over the sugar content. Fruit and water seems a much better idea! Great tips, ladies! I pinned it. Thanks for sharing on #TrafficJamWeekend.